To give you an idea of how integral Iker Casillas’ role in Spain’s rise in international football has been, we take a look at the year of his debut for La Roja, 2002. The national team was ranked seventh in the world, a ranking most probably considered generous due to FIFA’s flawed ranking system. Their best performances at a World Cup were a couple of Quarter Final exits at the 1994 and 1934 tournaments. The team was perceived to be a soft power, a bunch of talented individuals who pose no threat to breaking the hegemony of the other footballing heavyweights. Fast forward 11 years and Spain lie pretty on top of the FIFA rankings, Casillas is Spain’s record cap winner and the team go to Brazil next year as firm favorites to retain the title they won so emphatically in 2010. Born to a civil servant and a hairdresser in the summer of 1981 in Mostoles, Madrid, Iker Casillas has gone to become one of the poster boys of the city of his birth. “Saint Iker” started his career in Madrid’s Castilla during the 1990-91 season. Although he was called up on a few occasions in the 1997-98 and 1998-99 seasons, it was in the 1999-2000 season that he cemented his spot as Real Madrid’s number one keeper. A number of match winning saves in the 2002 Champions League final helped Real Madrid win their ninth European Cup. In early 2009, he became Real’s highest capped goalkeeper. By this time he was generally considered to be the finest player of his position in the world. As with the club, Casillas moved up the ranks with the national team. Having represented Spain in all age groups, he made his debut on 3rd June, 2000, against Sweden. The 2002 World Cup was his breakthrough tournament where he cemented his spot after a freak accident ruled first choice keeper Santiago Canizares out of the tournament. Casillas has gone on to become Spain’s most capped player in history with 152 caps. He captained his national team to a victory in the 2010 World Cup which was sandwiched by victories in the 2008 and 2012 European Championships. Iker Casillas is one of only two goalkeepers to be voted Best Goalkeeper by IFFHS four times in a row. He was voted Best Keeper of the 1010 World Cup and received the same award for the 2008 and 2012 European Championships. He has also been in UEFA’s Team of the Year six times. He has also been voted La Liga’s best goalkeeper for two seasons. He is the United Nations’ Goodwill Ambassador for its Development Programme’s Millenium Goals. In 2005, he was the face of Reebok’s 'I am What I am' global campaign. His relationship with Reebok ended in 2012, when he signed for Adidas. The season of 2012-13 was fraught with difficulties for Iker. A patchy relationship with manager, Jose Mourinho saw him lose his starting place for the side, an unthinkable thing in the past. He was consistently left on the bench throughout the entirety of the season with the coach citing “poor form” as his reason. It was believed that this was Mourinho’s way of getting back at the Madrid media who hounded him at every turn. 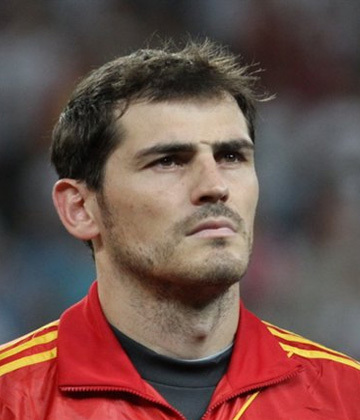 Casillas, for his part, held a dignified silence throughout the affair. The start of 2013-14 season has seen him back in his place, albeit only for European ties. Manager Carlo Ancelotti prefers Diego Lopez for domestic games. Casillas is a statesman in the dressing rooms of both Real Madrid and Spain. He, along with Xavi, is largely credited with thawing the difficulties between the players of Barcelona and Real Madrid which threatened to undermine the country’s bid to win the World Cup in 2010. 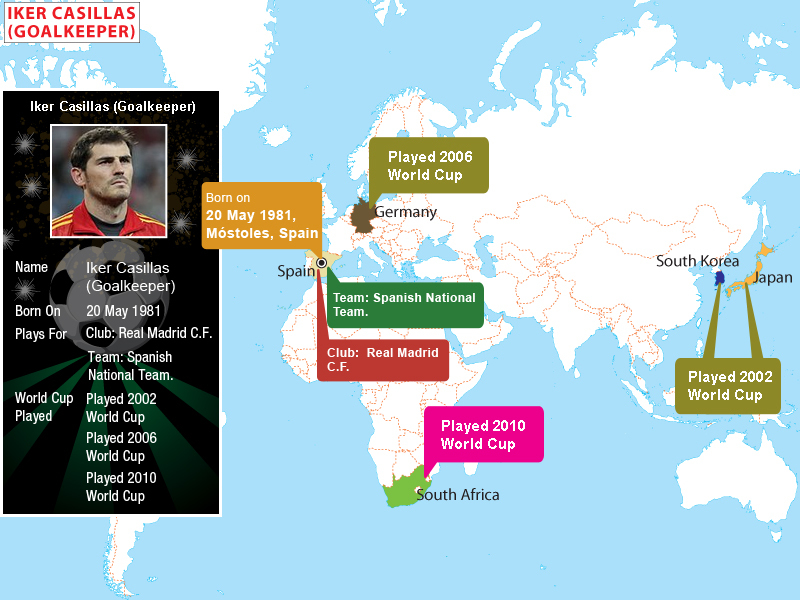 Spain’s meteoric rise in international football is largely intertwined with Casillas’ career projection. Heading into the World Cup, a Casillas lacking match practice could prove costly for La Furia Roja but expect Casillas to give it his best.